Ingredients: Talc, Nylon-12, Boron Nitride, Aluminum Starch Octenylsuccinate, Ethyl Macadamiate, Dimethicone, Magnesium Myristate, Synthetic Fluorphlogopite, Phenoxyethanol, Trimethylsiloxysilicate, Lauroyl Lysine, Caprylyl Glycol, Polybutene, Hexylene Glycol, Ethylhexylglycerin, Tocopherol, o-Cymen-5-ol, Methicone (in shade 749A), MAY CONTAIN (based on colour): Mica, Iron Oxides/CI 77491, CI 77492, CI 77499, Titanium Dioxide/CI 77891, Red 40 Lake/CI 16035, Yellow 5 Lake/CI 19140, Ultramarines/CI 77007. Dont blend very well and I can't even see the highlight on my skin. 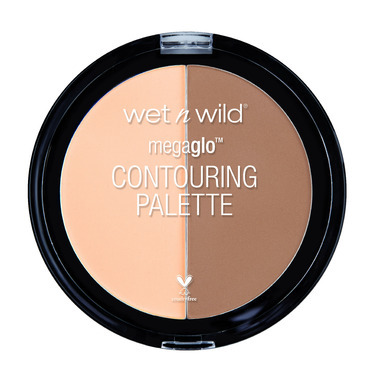 This is a nice cool-toned contour shade that applies and blends easily on the skin. The product is very soft and kicks up a fair amount of powder, best to use a light hand when applying. The light shade is good for setting concealer under the eyes to lighten and brighten the area. Great product at a great price.